Villa Lukas is located in the picturesque village of Imerovigli, at 400 meters above sea level and has the typical style of the Cyclades. 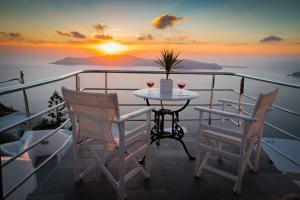 It offers accommodation with views of the caldera, the volcano and the famous sunset of Santorini. Please inform Villa Lukas in advance of your expected arrival time. For this, you can use the special requests section when making the reservation or contact the accommodation directly. The contact details appear on the booking confirmation. Guests must inform Villa Lukas of their expected arrival time in advance. For this, you can use the special requests section of the reservation form or contact the property. The reception schedule is from 08: 00 to 22: 00. A shuttle service is available upon request and at an additional cost. If you wish to use this service, please inform Villa Lukas in advance. This studio has a bed carved in the rock and includes access to the terrace with views of the caldera, the volcano and the sunset (to access the terrace you have to climb 12 steps). Studio with traditional décor and private balcony overlooking the Aegean Sea, the caldera and the volcano. It has 1 iron bed or 1 recessed bed and sitting area with wooden sofa or built-in sofa for an additional guest. This room is traditionally decorated and has a large terrace with views of the Aegean Sea, the caldera, the volcano and the sunset. It has a built-in bed and separate living area with 2 built-in sofa beds. This type of room is for 4 persons and no extra beds can be added. This spacious suite is on the top floor and features a terrace with an outdoor hot tub and views of the sunset and the volcano. The bathroom is decorated in a mosaic style and features a shower cabin and luxury toiletries. At the bequest, a bottle of local wine and a fruit basket are offered. Elegant suite located on the top floor. It has air conditioning and a private 20 m² terrace with a private outdoor hot tub and views of the Caldera, the volcano, the sunset and the Aegean Sea. It has 1 bedroom with large double bed and living room with sofa. It also includes a private bathroom with mosaic, slippers, bathrobes and toiletries.